Nestled in the Montalcino hills in one of the world’s most important terroirs, Poggio Landi produces expansive melodious and complex wines. The grapes come from Montalcino vineyards lying between 175 and 500 meters above see level whose exposition and soil composition vary. A treasure trove of biodiversity goes hand in hand wiht the magic of this land and its wines. A world within a world. 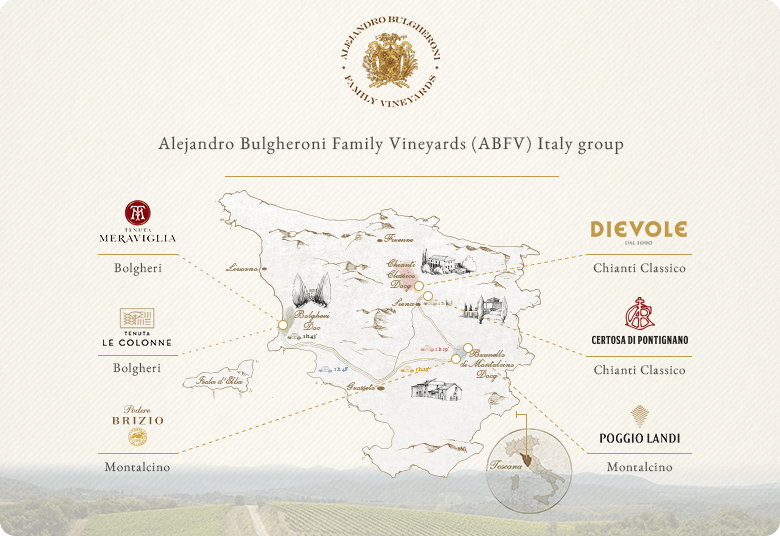 This is one way of describing Poggio Landi, an estate at one with the Montalcino terroir, a winemaking region hailed as paradise by international enthusiasts and connoisseurs. A spellbinding, deeply evocative place sets the scene for Poggio Landi, a winery focused on delivering the utmost quality with quantities capable of meeting the market desires of millions of Brunello lovers worldwide. After all, it’s superfluous to dwell on the power that Montalcino holds over wine lovers at every latitude. Finding a symbiosis this strong between the land and its wine is a rarity. Here the concept of terroir takes on significance inaccessible to others. Like dancing, you arch, you stretch, turn to East and set in the West: it conceals treasure this mild and melodious land, intoxicated by beauty at every step so similar, so different. A glass of Brunello di Montalcino is not simply a wine of extraordinary quality; instead it is a way of experiencing a lingering portrayal of the landscape, the centuries-old labours of man and his ability to reap from the land, through passion and dedication, the finest fruit that the earth is capable of cultivating. More than that, it is a sip of history and Tuscan vineyards. An history imbued with remembrance of when Brunello took centre stage in the 17th century, served at the noblest of tables, including the British Royal Family. It is no coincidence that Brunello di Montalcino was the first Italian wine to obtain DOCG status in 1980. Poggio Landi plays an illustrious part in this context. 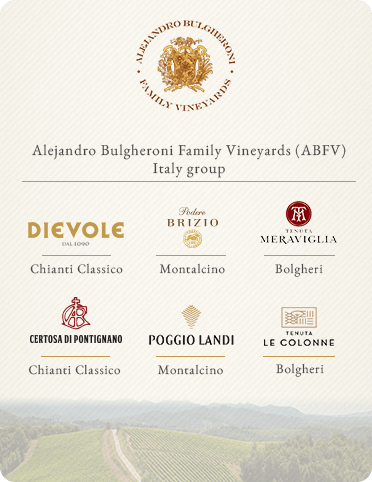 Poggio Landi estate has 75 hectares of vineyards, which skirt some of the most prestigious areas of the denomination, from the historic Montalcino vineyards in the north to those rich in character in the south. A vast surface area, guaranteeing variations in soil and exposition as well as altitudes above sea level, our winemaker is perfectly placed to “play” with a biodiversity emblematic of the allure of Poggio Landi. Respect for history and land is in fact the common denominator across all of the ABVF wineries. Every wine is the product of vineyard work aimed at maintaining balance among the wines with care taken to preserve the vitality of the soil. Spontaneus fermentation using solely indigenous yeat, is essencial for expressin terroir. Refinement in large French oak casks is key to mantain the organoleptic characteristics of the grapes. While Brunello is our pride and joy, Rosso di Montalcino DOC is the young and fresh red wine of our selection. The property includes Podere Belvedere villa, which rises up like a vision to visitors, a priceless jewel in the Montalcino area.